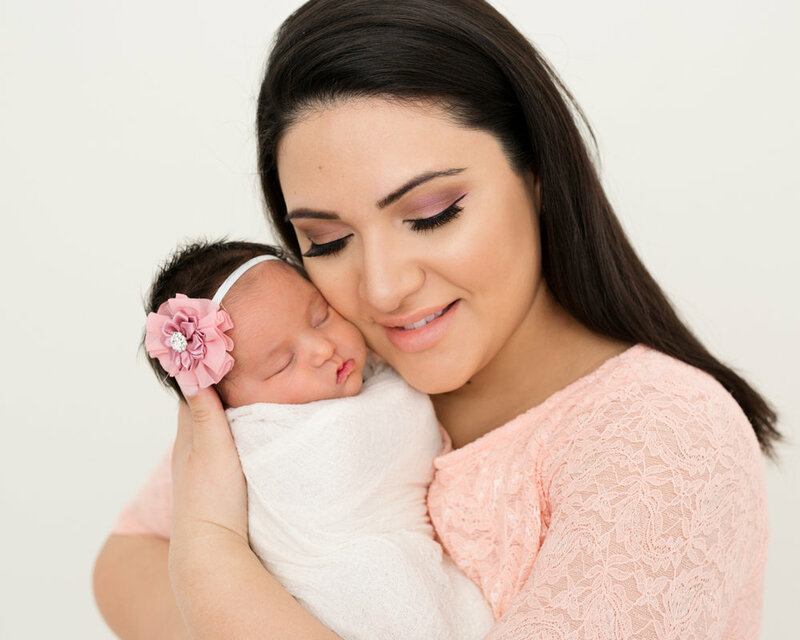 I am so excited; I finally get to blog about the beautiful Hovaizi newborn session. You may remember a couple of weeks ago I blogged about their beautiful home maternity session. I have been waiting until Mom was able to have her newborn reveal session and see her images for the first time before I could finally share these. Baby Hovaizi was so tiny and so precious. She did so well with her first photo shoot. I was able to get several beautiful shots of her with Mom and Dad. Little brother wasn’t up to a photo shoot the day we had the newborn session. However, from what Mom and Dad told me, it sounds like he was totally in love with her and was a protective older brother. Here are a few of my favorite images with baby Hovaizi and her parents. I really love to shoot images where baby is close to Mom and Dad’s face. I do this because it is fun to try and see who a baby looks like as they grow and develop. Plus kids later down the road love asking you who they look like when they were born. My daughter is almost 11 and she loves looking at her newborn photos and trying to see who she resembled. I know baby Hovaizi when she gets older will love looking at these images. Finally, we got to solo shots of baby Hovaizi. Oh my gosh what a sweetheart she was. She really was a good baby. She didn’t fuse and she really worked with us on several different positions we put her in. As always safety is my number one priority so we kept her safe on a posing cushion with mom nearby spotting her. We also didn’t do any unsafe poses; I don’t do the head up one or any poses that would strain baby’s neck. We kept them simple but still sweet at the same time. One of my favorites is the one with the crown and angel wings, Mom had brought those props for us to use. I am glad she did, they were so sweet. At the end of the shoot we wanted to do something really special. Since we did the milk bath photos for Mom’s maternity that included beautiful flowers, I thought how sweet it would be to surround baby Hovaizi in beautiful flowers too. Plus she was a spring baby, so what says springs but spring flowers. 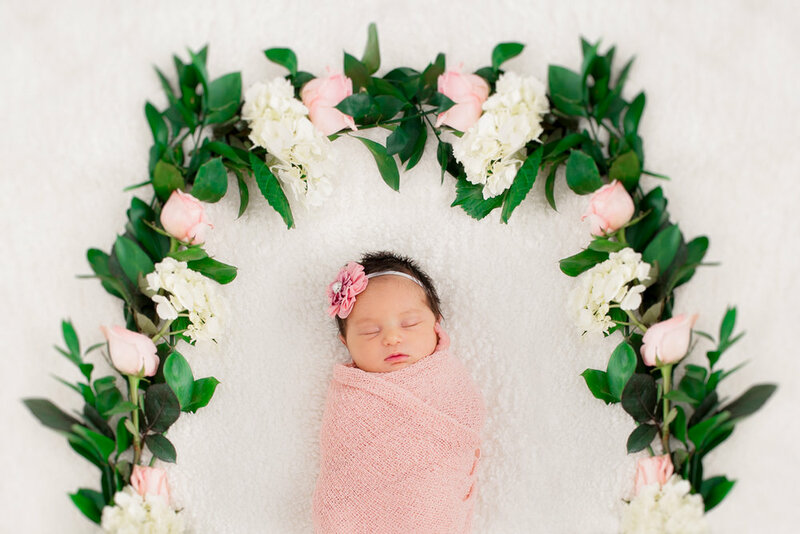 Sweet little girl slept through the whole set up and looked so snug in her swaddle in the middle of a wreath of flowers. I will be honest this is one of my favorite newborn images I have ever taken. This was a really great newborn session. I feel so honored that the Hovaizi picked me to help document this wonderful time in their family’s life. I hope to be able to capture many more milestones for them.